Delphiniums are tall, enchanting blooms with a unique form that come in many vibrant colours. They have become a permanent cottage fixture in England, and it is no wonder since they have been hand-pollinated and carefully selected for quality and flare in England since the early 20th Century. Another name for Delphinium is “Larkspur”. These beautiful blooms add a touch of grace to any garden and make a wonderful bouquet of cut flowers that will last about seven days in a vase. Delphiniums are often six to eight feet tall, but also come in dwarf varieties of about two feet tall. Dark green foliage is topped with upright, showy flowers. They have bold blooms of the three primary colours-red, blue, and yellow, as well as many blends and combinations. The flower itself has five sepals with three or four petals in the middle (commonly called “a bee”). Biennial and annual delphiniums are available, although perennials are the most common. 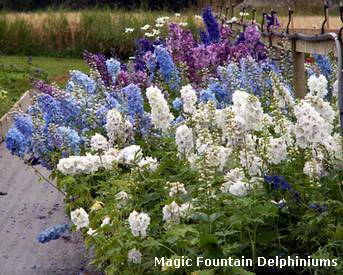 Delphiniums prefer moist, cool places and blooming occurs in late spring. You will need four bamboo canes about four feet high for each plant, and some twine. You will find that many bamboo canes will blend in with the colour of the stems. Make sure your delphiniums are thinned at least two feet high. Insert four bamboo canes around the plant to form a square. Make the first tie about a foot off the ground to the stem of the plant. It is crucial to tie the stems, and not the tower of flowers. Make the second tie just below the flower spike, about two feet from the ground. If done properly, staking should not be obvious. Remove hollow staking canes over winter so that pests can’t live in them until spring. I’meant impressed by the height of your delphiniums – my tallest get about 5 feet high. And, yes, I’ve had a second blooming after cutting down the first flower stems once they are finished blooming. I usually cut at the base of each flower stem, water and feed the plant with Miracle Grow, or similar fertilizer, then wait a while. Second, smaller, blooms often appear a few weeks later.